The Guinault and Lebrun companies have been similar operations for many years. They are both family businesses. In their own fields they are both experts being driven by innovation, core technology ownership, and a ‘people’approach. 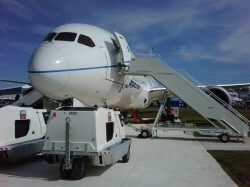 Together they manufacture a complimentary range of Ground Support Equipment for Aviation. Guinault Electrical power (GPU Ground Power Units), pneumatic power (ASU Air Start Units), heating power (air cabin heaters). Lebrun Cooling power (Air Conditioning Units). 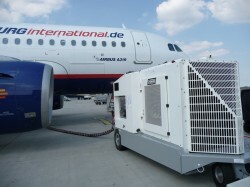 We decided in 2010 to join together to offer a unique global and complete solution for aircraft ground power. The Guinault-Lebrun Holding Company with its Head Office in Luxembourg is the “cementation” of an idea, which makes sense for us all. Employees, managers, suppliers, owners and partners can all benefit. Whilst on the ground, an aircraft requires special electrical power: 400Hz or 28Vdc. The use of a ground power unit (GPU) instead of either an aircraft engine or Auxiliairy Power unit ensures very significant savings in terms of fuel consumption and maintenance. Also, it is environmentally friendly, as it greatly reduces noise level and CO2 emissions at the airport. If 50 or 60 Hz power is available, the GUINAULT-LEBRUN Frequency Converter will offer clean low harmonics, low noise and very reliable 400Hz or 28Vdc electrical power. 90 kVA and 180 kVA units have been especially designed for extreme outdoor conditions. Whether operated in a maintenance hangar, bridge mounted, fixed on the ground, or towable, the unit remains extremely reliable, quiet, and user-friendly. In remote area, mains power might not be available. A diesel driven ground power unit is then the suitable solution. Although most aircraft are fitted with an onboard APU to start engines, an Air Starter is needed should the APU fail. 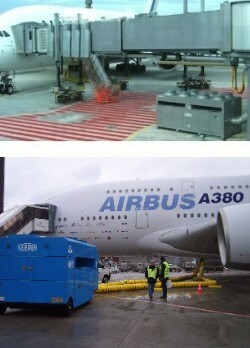 Even if the aircraft is allowed to fly if the APU is out of service, it cannot start its engines. The air start is rarely used, but if needed, reliability is a must. Passengers and crew are on board and waiting for takeoff, and a failure in the pneumatic aircraft engine start can lead to very expensive aircraft engine damage. The Guinault-Lebrun units use electronically controlled air-flow / pressure / engine rpm technology to keep the main components (diesel engine and screw compressor) in the smoothest operating conditions, whatever the type of aircraft. Guinault-Lebrun have used their historical expertise in 400 Hz power supply (Guinault since 1949) and in cooling systems (Lebrun since 1866) to offer customized solutions for airport ground support requirement. We offer a customized solution, based on Mobile and Fixed units (air conditioning units, ground power units, air start units), with either electrical or Diesel power. Air Conditioning units (ACU) are designed to take over the functions of the aircraft APU and maintain the appropriate temperature within the cockpit and the cabin of any aircraft during pre-flight servicing, loading and maintenance. This alternative dramatically reduces CO2/NOx emissions and noise level while leading to major savings both in fuel and the maintenance cost ofthe on-board APU. Guinault-Lebrun units integrate the latest industrial cooling technologies and offer the highest efficiency and performance in the market. Available in trailer mounted, truck mounted or ground mounted Guinault-Lebrun Air Conditioning units suit all types of aircraft in all climates. Completely self-contained, with compact design and very low noise level, Guinault-Lebrun Air Conditioning units can be operated at the gate, parked in a remote area or for maintenance purposes in a hangar. Guinault-Lebrun is still supporting GPUs in the Middle East, delivered with the Dassault Mirage in 1973. The GPU type GB60, is the most compact GPU on the market, MIL spec. compliant, it can be transported by helicopter at 180 km/h with the usual straps. In 2010, a very compact ACU has been designed for fighter aircraft, fully compliant to MIL standards: dimensions 104 x 84 inches – height 62. In 2011, Guinault-Lebrun has delivered 90 and 180 kVA 400Hz GPUs, which are able to operate in parallel for AWACS aircraft. MIL Spec. 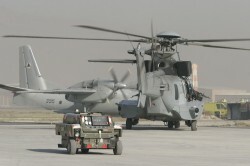 Air Transportable ACU and ASU are being delivered in France and the UK. Military units use most of the high level of technical expertise available at Guinault-Lebrun to ensure the specific demands : EMC, air transportability, and extreme weather conditions.